Thematic version 0.9 represents a major change in Thematic. Actually, this release represents everything I’ve learned from the Thematic user community and my continual efforts in studying how most WordPress themes are actually used. Thematic is all about you: what you want to do with it, how you’re using WordPress, and how you’re going to use it to meet your online goals. Head to the Thematic download page and get it now or keep reading and find out what the story is with the best version yet of your favorite WordPress Theme Framework. As you can see, there have been some changes. Thankfully, they’ve all been for the better. First of all, I’ve done away with building to a consistent baseline. That is, having everything line up to the same baseline across content and sidebar. In theory, or on a static site, that’s a great idea. In practice, I’ve found that it ends up being a detriment when you’re customizing using the default style as a guideline or starting point. Basically, things stop lining up and it makes me koo-koo bananas when I go to visit your blog. What I’ve replaced it with is a complete rethink of the Thematic typographic scale that adds up to a more harmonious overall appearance. Something beautiful on it’s own but easy to fit into almost any design. You can think of it as a damn elegant theme that’s ready for you to build a successful website with. Beautiful, pleasant, damn elegant typography, and simple design, are a must for engaging your website visitors and keeping them coming back. Now Thematic takes care of all that for you. The real icing on the cake for people ready to take their Thematic theme to the next level, Hooks and Filters, are now everywhere in Thematic. Making your Child Theme a potential super-plugin for WordPress. You can see the complete list on the new (in development) Guide To Customizing The Thematic Theme Framework along with code snippets that you can just cut and paste into your Thematic Child Theme. Thematic now has jQuery-powered drop-down menus built in to the core. This is one of the most common feature requests I’ve received—but I resisted doing this for a long while. Finally, I came to the conclusion that Thematic’s refusal to gracefully handle sub pages was a deficiency. Especially since it’s so easy to modify the code that’s creating the drop down menus with your Child Theme. First of all, if you don’t like drop-down menus, outright killing the drop downs in your Child Theme is actually pretty easy. Overriding and adding to the default options with your Child Theme is pretty easy too—once you know how to do it. Thematic has always stood out amongst premium and free themes by letting you edit the text that appears in the footer of your blog. Even going so far as letting you remove the link back to the Thematic Theme release page without having to edit the actual theme files or purchasing special “unlock” codes. And now, we’ve made it even easier to edit your footer text by using shortcodes for some common footer items. You probably already know that Thematic let’s you easily, and rapidly, build bullet-proof websites with it’s modular CSS. You can use @import to load up a CSS reset, basic typography, 2 or 3 column grids, basic styles, and more. Now Thematic gives you a head start on Child Theme development. This is the real secret to taking advantage of everything Thematic has to offer. As of now, there are 2 basic Child Themes officially part of the Thematic project, Thematic Classic and A Sample Thematic Theme. A Sample Thematic Theme resides in the main thematic directory. Simply move a copy into your wp-content/themes directory, rename it and activate it and you’re on your way to customizing your theme the smart way—without touching the original theme files. Want to add a search form to the header, remove the menu, add more options to the menu, register new sidebars, or custom widgets? You can do all that and more from within your Child Theme functions using the hooks and filters built into Thematic. The Thematic Classic Child Theme (download it here) approximates the look of the original Thematic, pre version 0.9. It’s also a good example of how to make a custom Child Theme by mixing and matching the modular CSS files. Perfect for those of you who have been reluctant to customize your theme using a Child Theme. Thematic has a ton of contributors and hawk-eyed supporters on a hunt to make it better but I’d like to give a special thank you and shout out to Chris Gossmann who helped make this release a killer one. Chris, you’re awesome. Thank you. And an extra big thank you goes out to all the people working on translations that have helped make Thematic a truly international project. _e(‘Thank you’, ‘thematic’). And to everyone using Thematic, talking about it, and promoting it, thank you. Thematic could have been just a fun project for me but it’s all of you, spurring me on to make it better, that’s making it a great one. Download Thematic and build your blog the smart way. This is a great framework to build something special, especially for those of us who need a little extra help with the coding. Thanks, Ian! And, I look forward to seeing what the Thematic community does with this powerful tool. Just upgraded to 0.9 and so far so good! Thanks for including the classic stylesheet in the pack! I love the core drop down menus & the new hooks are just what I’ve been looking for. Can’t wait to start playing with it. Note that I’m just trying to modify the default hooks-filters file and haven’t tried to create a child functions.php file yet. Any suggestions? Suggestion: don’t edit the thematic file. 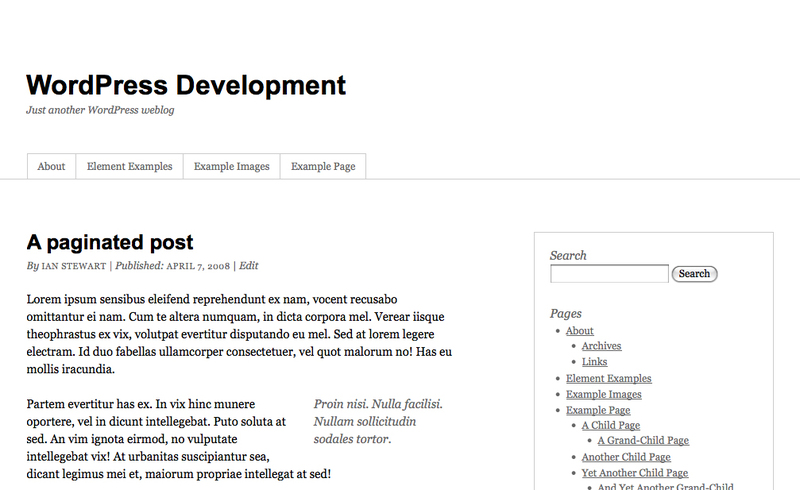 😉 You can add your own custom blog description using functions.php in your child theme. I’ve just used this latest version of thematic 0.9 to build a custom website. I must say it was such a pleasure! The typography is incredibly elegant. That is a hard balance to find, but you’ve found it. It’s pretty amazing that I can make a whole new site with just a few lines of code in a child theme to customize the things I need. While it does take a big of thinking to grok the concept of adding and removing actions, it is worth it in the end, allowing you to add whatever elements you need anywhere in the theme using the myriad action hooks. Thanks Ian, Chris and others for such a great wordpress theme framework! Absolutely brilliant – Thanks so much! Beautiful got a sneak when you sent it to me last week. No doubt the best yet. Working on creating a child theme that looks like the WP 2.7 Admin. I know there is a theme already like it. But not powered by thematic:) If it works out I’ll post a linky. Calling it WPMatic at the moment. I just found a little bug in your hooks-filters.php. There is a blank missing between “entry-date” and the actual date, line 518. And as a proposition for the next version: How about integrating “co-authors”, i.e. displaying more than one author for a post/page? It would be cool if you could also insert a [back-to-top] shortcode for the footer options. You could just insert a name=”top”> after the body tag in the header.php and then you can insert the link Back to Top somewhere in the footer. But make it one of those handy shortcodes. Edit: arghhh!! I dont know how to insert html code sample in to the comment without it being seen as html! WOW! Amazing theme. This blows me away. Very very very very helpful and downright…awesome. Why buy Thesis when you can get Thematic? thanks a lot for all your hard work, ian! excellent framework to build upon! Hmmm… It seem truly interesting. I have download it, and also subscribe to your mailing list in order to keep in touch. Thanks for sharing your work! I’ll take a serious look at this. Since i am new to WP and i want to learn to make my own themes. Thanks again. I only really discovered thematic last night, and can’t try out the new version just yet (I’m at work, see), but from what I’ve read this morning, it seems to be as much of a revolution as WordPress itself. I cannot recall the amount of time I’ve downloaded a theme, hacked it to death and then thought ‘surely this isn’t the best way’. Now, it seems, I can start with a truly great foundation that’s extensible and dependable!